This lens is intended for producers and broadcasters engaged in documentary, natural history, and the many other challenging location productions that seek superb image capture over very considerable distances. These lenses embody superb built-in image stabilization systems that have become industry renowned. Aerial shooting, sports and entertainment coverage, portable acquisition in arduous terrain and under dynamic environmental situations (heavy winds) – are all superbly supported by these stalwart HD lenses. 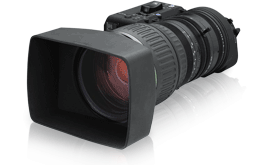 The HJ40x14B is a high definition EFP lens that brings entirely new shooting flexibilities to field production. The HJ40x14B can achieve an unprecedented 1120mm. This lens represents the very best in optical and mechanical design and their unique optical image stabilization systems make possible the capture of rock steady high definition imagery under the most adverse of field conditions.